Will “Go Fast, Go Hard” On Offense Put an Added Strain on BYU’s Defense? The mantra heard throughout this offseason has been “Go Fast, Go Hard”. This is in reference to the offensive tempo as well as the offensive mindset that Robert Anae intends to make the trademark of the BYU offense. Last season, at times, BYU went fast with their periodic employment of the Nitro offense where Riley Nelson would pick and choose moments to accelerate the pace of the offense and get the next snap off as quickly as possible. Despite the difficulty in several games to put points on the board, BYU still managed to be successful at winning the time of possession battle (19th nationally at 31:57 per game). As a result, BYU ran 77 plays per game on offense, which was 5.5 plays per game more than the NCAA average. In part because BYU was able to win the time of possession and in even larger part because BYU had the 3rd ranked defense in 2012, BYU’s opponents only ran 59.9 plays per game, the fewest in the nation. As part of Go Fast, Go Hard, Anae has mentioned trying to run as many as 90 plays per game on offense. Only the 2012 Marshall team has averaged 90 plays per game for an entire season, so this is a lofty goal. Bronco is mindful of the impact this could have on his defense, mentioning several times that he expects his defense to have to be on the field for an additional 15 to 20 plays a game, due to the increased tempo on offense. Is this an accurate expectation? The analysis below will show that may not necessarily be the case. 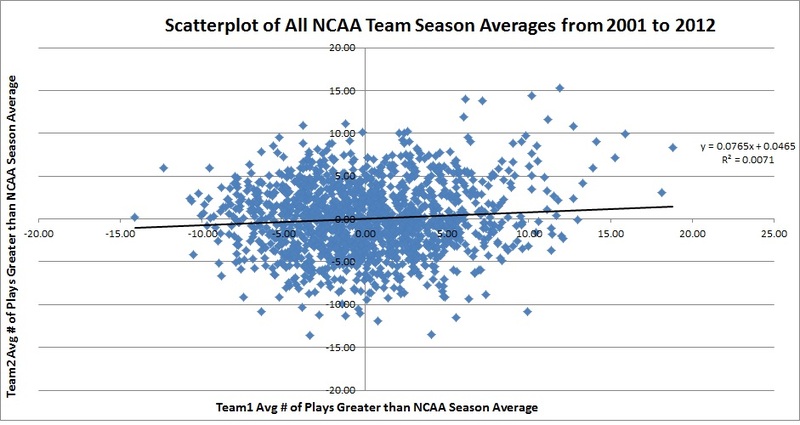 The scatterplot chart above plots the season average number of offensive plays per game versus the average number of defensive plays per game, both relative to the NCAA average for that season. The reason for this chart is to visually determine if more plays on offense necessarily results in more plays on defense. The chart boils down over 1,400 individual data points into a trendline. If Bronco’s premise is correct, the trendline would be expected to have nearly a 45 degree slope, or in other words, for every additional play on offense, there would a corresponding additional play on defense. However, the data do not show such a relationship; with the trendline just barely greater than horizontal. But does this relationship change for the handful of teams that REALLY push the pace? Since 2001, only 33 teams have averaged at least 80 offensive plays a game for an entire season. 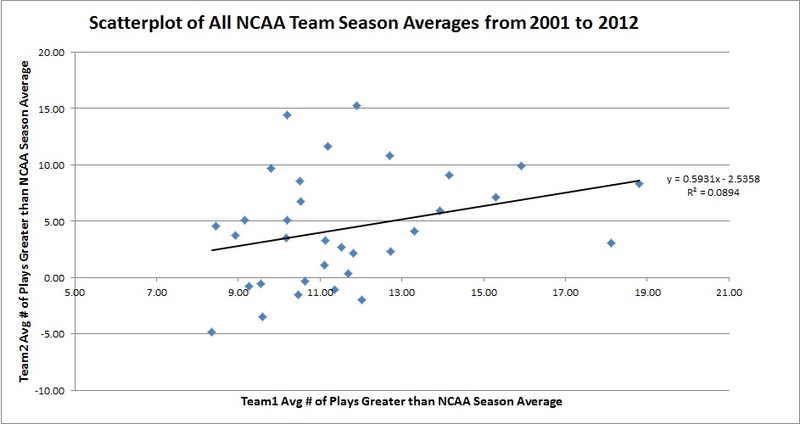 The scatterplot shows that for teams which really push the pace, it does often result in their opponents also running more plays per game than the NCAA average. Of the 33 teams that ran over 80 plays per game, 10 of them had opponents that failed to run their normal average number of plays per game and 23 of them exceeded their season’s average. Overall, these 33 teams’ collective opponents ran 3.16 plays more than they averaged for that season; far from the 15 to 20 plays that Bronco has been preparing for. The 2012 Arizona opponents ran 12.3 plays against the Arizona D more than they did overall, the largest increase of the 33 teams. It’s also worth noting that the 2012 Arizona defense was ranked 118th in the nation, so the large increase in their number of plays can’t be blamed entirely on their offensive tempo. The expectation is that the 2013 BYU defense will more closely resemble the 2012 BYU defense than it will the 2012 Arizona defense, so should we really expect to see the Cougar D on the field as much as Bronco fears? Based on the analysis above, even if BYU can up their offensive output from 77 to between 85 and 90 plays, it would appear the defense will be playing closer to between 5 to 10 extra plays than it will be 15 to 20. Well done. Very applicable. I would assume the correlation between excellent defense and BYU’s time of possession would support the 90 plays/game goal.